A second session after sunset has been established for Adventists doctors for reasons of Freedom of Religion and Conscience, thought the international written examinations organized by European Society of Anesthesiology (ESA) are taken simultaneously all over the world. The International Association for the Defense of Religious Liberty (AIDLR) believes the universality of human rights, dignity of every human being, and the fundamental freedom or religion, belief and conscience for all people, opens our horizon and opportunities on advocating in favor of people regardless of their political ideology, religion, culture, race, gender, education or social status. For it since its beginning, the AIDLR defends not a religion or a church, but a principle, the PRINCIPLE of freedom of religion or belief for all. 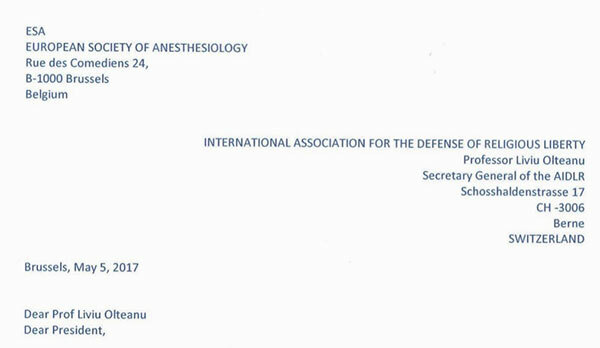 At the beginning of the year 2016, two Romanian Adventist doctors requested the AIDLR’ advocacy at the European Society of Anesthesiology (ESA) based in Brussels Belgium. Doctor Olteanu requested in behalf of the AIDLR to the ESA in 2016 to reschedule the written test of the European Exam for Anesthesia and Intensive Care after Saturday sunset that every year have been on Saturday for the worldwide candidates. In his advocacy Olteanu introduced what is a concerned issue for the Seventh Day Adventists and underling: The European Exam for Anesthesia and Intensive Care is scheduled to take place for many years on Saturday, making impossible for the believers of the Seventh-Day Adventist Church to pass that exam on account of their religious belief and conscience. The Seventh-Day Adventist Church is a worldwide church with 20 million of people who keep Saturday as a holy day and the doctors and students of this Church cannot participate in any exam for conscience reasons. The ESA President and Executive Manager evaluated the request received and looking to the international laws and declarations that are in favor of freedom of conscience, as the UDHR, the ICCPR and the United Nations Declaration Against Discrimination and Intolerance on Religion from 1981 article 6 that stresses: «In accordance with article 1 of the present Declaration... the right to freedom of conscience, religion or belief shall include inter alia...: (h) To observe days of rest and to celebrate holiday and ceremonies in accordance with the precepts of one’s religion or belief. The ESA staff mentioned in their answer sent to the AIDLR Secretary General on May 2017: After discussions that took place in ESA Examinations Committee and the ESA Board, the European Diploma in Anesthesiology and Intensive Care has been recognized globally for its quality, seriousness and ethical standard. Trainees from all over the world, from all geo-political environments and from all religions, major and minor, attend the different examinations provided by the ESA. To maintain the confidentiality and quality standards expected from participants and official institutions, the written examinations are taken simultaneously all over the world... and we need to deliver a flawless and trustworthy process. The ESA can therefore not change the organization of the examination for a minority and hence create an issue for the majority of other minorities. However, ESA is ready to consider a second session after sunset on the conventional examination day for the Seventh Day Adventists. To guarantee that no candidate from the main session of the Saturday morning and afternoon would communicate the examination questions to the candidates of the evening session, ESA will be very strict about the fact that all candidates of the evening session must be isolated and without any means of remote communication for the whole examination day and candidates of the evening session will be invigilated during the day. Dr. Olteanu thanked to the ESA staff for their wised and balanced solution, understanding and support of freedom religion and conscience in behalf of people’ differences and according to the international law.